The concept of aspect ratio can be difficult to grasp, but easy to understand once you see it. Aspect ratio is the ratio of the width of a display compared to its height. For example, the aspect ratio for widescreen displays is 16:9 and the ratio for traditional TVs is 4:3. For home theater purposes, you should go with a widescreen (16:9) display — that’s the right aspect ratio for DVDs, high-definition TV programming, and even many video games. If you’re buying a cheap tube TV for the kitchen or guest bedroom, you might still choose to go with 4:3. Academy Standard (or Flat), which has an aspect ratio of 1.85:1. Anamorphic Scope (or Scope), which has an aspect ratio of 2.35:1. Scope is also called Panavision or CinemaScope. 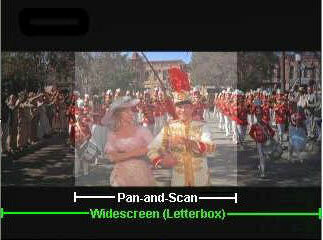 Pan and Scan: For each frame of a film, a decision is made as to what constitutes the action area. That part of the film frame is retained, and the rest is lost. What’s left is usually a fraction of the main frame, sometimes as little as 65 percent of it, and this can often leave out the best parts of a picture. Letterboxing: The second approach is to display the original full image on the TV set without filling the whole screen. When watching content formatted for a widescreen TV (16:9), you see black bars at the top and bottom of the image. Conversely, when watching content formatted for TV (4:3) on a widescreen TV, you see black bars on the left and right of the images. This is known as windowboxing. An obvious problem with viewing widescreen images on a normal 4:3 TV is that the image doesn’t use all 480 scanning lines of the screen. Some of those 480 lines get used just to draw black bars instead of drawing video you actually watch. (Some 4:3 TVs use a technique called anamorphic squeeze to eliminate this issue.) This yields lower resolution, something that anamorphic formats attempt to resolve. Also known as 16:9 Enhanced, Widescreen Enhanced, or Enhanced for 16:9 Televisions, anamorphic presentation squeezes the image horizontally until the full 4:3 frame is filled. If you look at an anamorphic picture on a 4:3 screen, the picture appears somewhat distorted because everything is compressed, but the full 480 lines of content are retained. Luckily, when you tell your DVD player you have a 4:3 screen, it puts the anamorphic image back into a letterbox. When played through a 16:9 player, the original width is presented, while maintaining the full 480 vertical lines of resolution. Most DVDs have both a Pan and Scan and a widescreen format (either letterboxed or anamorphic) on a DVD. Because including both versions creates an added expense to the studios, some DVDs ship with just one format onboard, and some titles actually have different formats on different discs. Be sure to check before you buy a disc if this is important to you.